This is a really pretty princess cut dress, medium weight cotton/lycra machine washable material (stretchy). It's available in sizes 1x to 7x (check measurements below!) 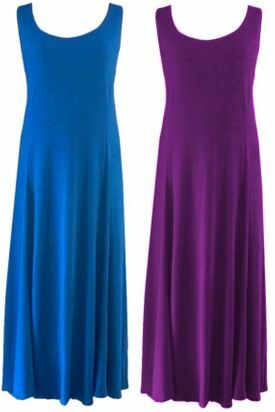 They're machine washable, stretchy, and have a wonderful drape! The appx length of these dresses is 52"-54". 1x: Chest:48" - Hips (appx):64" - Bottom Sweep:108" - Arm Hole:25"
2x: Chest:53" - Hips (appx):67" - Bottom Sweep:110" - Arm Hole:27"
3x: Chest:58" - Hips (appx):72" - Bottom Sweep:124" - Arm Hole:30"
4x: Chest:62" - Hips (appx):75" - Bottom Sweep:124" - Arm Hole:30"
5x: Chest:68" - Hips (appx):80" - Bottom Sweep:130" - Arm Hole:33"
6x: Chest:74" - Hips (appx):86" - Bottom Sweep:138" - Arm Hole:36"